The FDA has me scratching my head again. Last month they deemed brown rice to be whole grain. Um, who ever thought it wasn't a whole-grain food? From 1991 until now, the FDA, which regulates food labels for all U.S. packaged products, didn't allow brown rice to use the official whole-grain health claim that oats, barley, popcorn, whole-wheat bread, and other chosen grains have been putting on their packages and in advertising: "Diets rich in whole-grain foods and other plant foods and low in total fat, saturated fat and cholesterol may help reduce the risk of heart disease and certain cancers." To be a whole grain in the eyes of the FDA, a food must contain bran, germ, and endosperm (bran and germ are stripped away in products such as in white flour). Brown rice has all these components. The snag? When the FDA made its initial ruling, there was a minimum fiber content requirement that kept brown rice out of the club. Now research shows that the health benefits of whole grains are independent of their fiber content. So on May 6 the FDA finally approved the whole-grain health claim for brown rice, recognizing brown rice as a 100% whole-grain food despite its lower fiber content. Eight in 10 Americans know that whole grains are beneficial, but about two-thirds of us aren't meeting our quota of at least three servings a day, according to a USA Rice Federation survey. 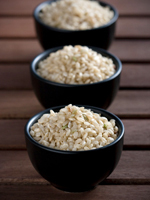 Take note: Just one cup of cooked brown rice provides two of three daily whole-grain servings. Here are a few ways I include brown rice in my diet, wherever I am. Let me know how you get yours. 1. At home: The Zojirushi Neuro Fuzzy Rice Cooker and Warmer prepares perfect brown rice. I simply add rice and water and set the timer it the a.m., and the rice is ready for whatever time I need it in the p.m.
2. At work: Uncle Ben's Ready Rice Whole Grain Brown are a quick, mess-free option. Just microwave the rice in its pouch for 90 seconds and you've got a warm, healthy snack. 3. Out and about: The P.F. Chang's China Bistro chain, selected as one of America's Healthiest Restaurants by Health magazine, serves brown rice standard with their excellent dishes.